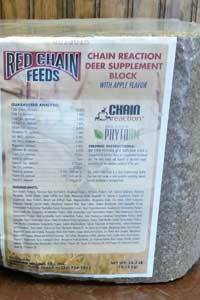 Whether you’re a weekend hunter looking for protein or a professional deer breeder chain reaction deer feed will deliver a nutrient package at the ultimate level to maximize the growth, health and antler development. No least cost formulation is ever used to compromise the nutrition level. You can always count on a consistent feed from load to load. Old process peanut meal is the basis for major protein. Peanut meal is extremely palatable and high in energy. Proper levels of energy carbohydrates and fat designed around ruminant animals. Highly fortified with calcium and phosphorus and at a proper ratio of 2 to 1. Healthy fiber levels for proper rumen function leading to healthier deer. Holistic approach with a blend of natural ingredients to optimize performance. Yeast components from live yeast, yeast extract and yeast culture. To support health digestion, immune support and palatability. Probiotics to support digestive function, immune health and improved feed digestibility. Prebiotics to balance gut microflora, enhanced protein absorption and to support a strong immune system. Enzymes added to enhance feed digestion and improve nutrient absorption. Phytonutrients that are encapsulated that make potent antioxidants and enhance flavor. Key components are oregano, cinnamon, chili pepper and rosemary. Fat sources – flaxseed oil, coconut oil and soybean oil that carry a level of omega 3 and omega 6. DIAMOND V ORIGINAL XPC – an all-natural, fermentation-based feed additive comprised of numerous beneficial metabolites together with beta-glucan and mannans, which help support overall health and performance. Hundreds of research studies across various species, including deer, prove that original XPC supports rumen health and feed digestibility. Improved rumen function allows deer to reach their peak genetic potential in terms of antler growth, milk production, body mass and herd health. ACTIVO PREMIUM FROM EW NUTRITION – a blend of microencapsulated essential oils and secondary plant compounds formulated specifically for ruminants. Due to manipulation of the microbial populations, Activo Premium optimizes the rumen fermentative processes. The final result is improved animal performance and/or better feed efficiency. ECOGEST YS FROM NOVA TECHNOLOGIES – whole plant Yucca schideigera. Controls manure odors (binds or blocks ammonia produced via microbial action in all animal manures). Natural flavoring substance improves feed intake. Natural source of phenolic antioxidants. Increased protein utilization, creates optimum rumen environment. TASCO FROM ACADIAN SEAPLANTS – a marine plant based natural feed ingredient that has GRASstatus. Tasco helps improve organic matter digestibility, heat stress and conception rates. ZINPRO Availa®4 is a nutritional feed ingredient for animals that contains a combination of organic zinc, manganese, copper and cobalt. These trace minerals are required by animals for numerous functions including: immunity, reproduction, skin and hoof integrity, growth and muscle development, milk production, fiber digestion and energy metabolism. 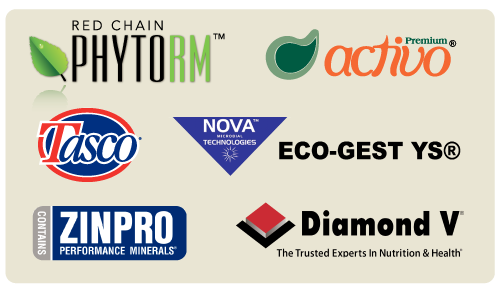 RED CHAIN PHYTORM – PhytoRM is a product created from red chain feeds that is comprised of many of the ingredients mentioned above. It’s made up of a blend botanicals, essential oils and secondary plant compounds, kelp (Tasco), yeast cultures, live yeast, enzymes, yucca, inorganic and organic trace minerals. To be fed to deer as a supplement to forage and native browse. Always provide plenty of fresh clean water. Keep feed in cool dry storage. A highly palatable protein supplement for deer. Contains peanut meal as the major protein source. A good level of calcium and phosphorus in a 2:1 ratio for antler development and body growth. Contains added vitamins A, D, and E and a trace mineral pack for growth, maintenance, and stress periods for deer. Also contains an organic form of zinc and other minerals. This feed contains a large amount diamond v yeast culture to assist in proper rumen fermentation and reduce any rumen upsets. Contains Tasco™ (for greatly increased immunity protection, antioxidant properties, slower metabolism and lower body temperature causing the animal to gain more from the same amount of feed and deal with stress better, microbe population in the rumen is optimized as well as the tissue lining the intestines) and ground yucca which acts as an anti-inflammatory for sore joints. Contains Calmin: a highly bio-available organic calcium & magnesium source made from algae, also functions as a PH buffer. 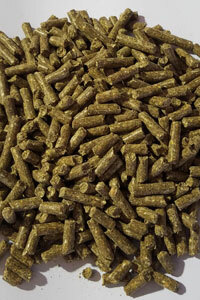 For hunters and game operations that desire a 20% protein pellet. This product contains a peanut meal base; the strong smell of peanut meal is great for attracting deer and keeping them coming back to the feeder. Well fortified in trace minerals including several chelated forms (chelated minerals are bound to amino acids, this helps the animal absorb and utilize more of the mineral in the body). Contains added vitamins A, D, and E, a 2:1 calcium to phosphorus ratio, and rumen bypass fat. Bypass fat is a form of fat that is not degraded as it passes through the rumen before it is absorbed in the intestines, therefore, a lower fat content in a feed with bypass fat can be just as effective as a higher fat feed with traditional fat sources. We created the Buck Creek Deer Pellet for those who hunt in low fence places where the deer freely roam and are "co-op fed" by the neighbors/pastures and do not need the higher level of extras found in our 17% and 20% Chain Reaction Deer Pellets. 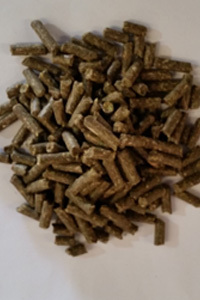 The major ingredients in the Buck Creek Deer Pellets are very similar to our 17% and 20% Chain Reaction Deer Pellets but less fortified in the vitamins/minerals/PhytoRM supplement package. 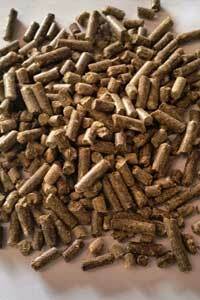 This allows the Buck Creek Deer Pellets to be more affordable and still provide great nutritional value to the low fence hunter. Designed to be fed free choice as a supplement to natural diet. Daily intake will depend on the food supply availability and the weather conditions of the year. An apple flavored protein block, fortified with vitamins and minerals. Also, includes Red Chain PhytoRM ingredient package which includes a blend of botanicals, essential oils, secondary plant compounds, kelp, live yeast, yucca, and other premium ingredients. Calcium - 11.5% min. - 13.5% max. Salt - 25% min. - 28% max. Pour on the ground on in a mineral feeder in ares where deer frequently visit. Avoid placing in locations where domestic livestock can consume the mineral. DO NOT FEED TO SHEEP. 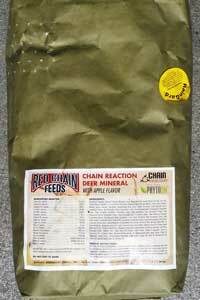 Apple flavored deer mineral, heavily fortified with vitamins and minerals to ensure proper deer health. Also, includes Red Chain PhytoRM ingredient package which includes a blend of botanicals, essential oils, secondary plant compounds, kelp, live yeast, yucca, and other premium ingredients. The calcium and phosphorus in the product promote strong frames and large racks. High energy attractant for keeping deer coming to the feeders. 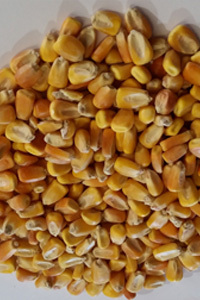 Corn is cleaned and packaged in a durable plastic bag.